A hard disk drive (HDD), hard disk, hard drive or fixed disk is a data storage device that uses magnetic storage to store and retrieve digital information using one or more rigid rapidly rotating disks (platters) coated with magnetic material. The platters are paired with magnetic heads, usually arranged on a moving actuator arm, which read and write data to the platter surfaces. Data is accessed in a random-access manner, meaning that individual blocks of data can be stored or retrieved in any order and not only sequentially. HDDs are a type of non-volatile storage, retaining stored data even when powered off. Introduced by IBM in 1956, HDDs became the dominant secondary storage device for general-purpose computers by the early 1960s. Continuously improved, HDDs have maintained this position into the modern era of servers and personal computers. More than 200 companies have produced HDDs historically, though after extensive industry consolidation most current units are manufactured by Seagate, Toshiba, and Western Digital. HDD unit shipments and sales revenues are declining, though production (exabytes per year) is growing. Flash memory has a growing share of the market for secondary storage, in the form of solid-state drives (SSDs). SSDs have higher data-transfer rates, higher areal storage density, better reliability, and much lower latency and access times. Though SSDs have higher cost per bit, they are replacing HDDs where speed, power consumption, small size, and durability are important. The primary characteristics of an HDD are its capacity and performance. Capacity is specified in unit prefixes corresponding to powers of 1000: a 1-terabyte (TB) drive has a capacity of 1,000 gigabytes (GB; where 1 gigabyte = 1 billion bytes). 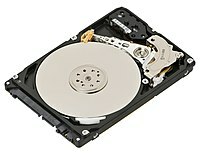 Typically, some of an HDD's capacity is unavailable to the user because it is used by the file system and the computer operating system, and possibly inbuilt redundancy for error correction and recovery. Performance is specified by the time required to move the heads to a track or cylinder (average access time) plus the time it takes for the desired sector to move under the head (average latency, which is a function of the physical rotational speed in revolutions per minute), and finally the speed at which the data is transmitted (data rate). The two most common form factors for modern HDDs are 3.5-inch, for desktop computers, and 2.5-inch, primarily for laptops. HDDs are connected to systems by standard interface cables such as PATA (Parallel ATA), SATA (Serial ATA), USB or SAS (Serial attached SCSI) cables. A hard disk drive (HDD), hard disk, hard drive or fixed disk[b] is a data storage device that uses magnetic storage to store and retrieve digital information using one or more rigid rapidly rotating disks (platters) coated with magnetic material. The platters are paired with magnetic heads, usually arranged on a moving actuator arm, which read and write data to the platter surfaces. Data is accessed in a random-access manner, meaning that individual blocks of data can be stored or retrieved in any order and not only sequentially. HDDs are a type of non-volatile storage, retaining stored data even when powered off. Introduced by IBM in 1956, HDDs became the dominant secondary storage device for general-purpose computers by the early 1960s. Continuously improved, HDDs have maintained this position into the modern era of servers and personal computers. More than 200 companies have produced HDDs historically, though after extensive industry consolidation most current units are manufactured by Seagate, Toshiba, and Western Digital. HDD unit shipments and sales revenues are declining, though production (exabytes per year) is growing. Flash memory has a growing share of the market for secondary storage, in the form of solid-state drives (SSDs). SSDs have higher data-transfer rates, higher areal storage density, better reliability, and much lower latency and access times. Though SSDs have higher cost per bit, they are replacing HDDs where speed, power consumption, small size, and durability are important. Hard disk drives were introduced in 1956 as data storage for an IBM real-time transaction processing computer, and were developed for use with general-purpose mainframe and minicomputers. The first IBM drive, the 350 RAMAC in 1956, was approximately the size of two medium-sized refrigerators and stored five million six-bit characters (3.75 megabytes) on a stack of 50 disks. In 1962 the IBM 350 RAMAC disk storage unit was superseded by the IBM 1301 disk storage unit, which consisted of 50 platters, each about 1/8-inch thick and 24 inches in diameter. Whereas the IBM 350 used only two read/write heads which were pneumatically actuated and moved in two dimensions, the 1301 was one of the first disk storage units to use an array of heads, one per platter, moving as a single unit. Cylinder-mode read/write operations were supported, and the heads flew about 250 micro-inches (about 6 µm) above the platter surface. Motion of the head array depended upon a binary adder system of hydraulic actuators which assured repeatable positioning. The 1301 cabinet was about the size of three home refrigerators placed side by side, storing the equivalent of about 21 million eight-bit bytes. Access time was about a quarter of a second. A modern HDD records data by magnetizing a thin film of ferromagnetic material[f] on a disk. Sequential changes in the direction of magnetization represent binary data bits. The data is read from the disk by detecting the transitions in magnetization. User data is encoded using an encoding scheme, such as run-length limited encoding,[g] which determines how the data is represented by the magnetic transitions. Only a tiny fraction of the detected errors ends up as not correctable. For example, specification for an enterprise SAS disk (a model from 2013) estimates this fraction to be one uncorrected error in every 1016 bits, and another SAS enterprise disk from 2013 specifies similar error rates. Another modern (as of 2013) enterprise SATA disk specifies an error rate of less than 10 non-recoverable read errors in every 1016 bits. [needs update?] An enterprise disk with a Fibre Channel interface, which uses 520 byte sectors to support the Data Integrity Field standard to combat data corruption, specifies similar error rates in 2005. Areal density is the inverse of bit cell size, so an increase in areal density corresponds to a decrease in bit cell size. In 2013, a production desktop 3 TB HDD (with four platters) would have had an areal density of about 500 Gbit/in2 which would have amounted to a bit cell comprising about 18 magnetic grains (11 by 1.6 grains). Since the mid-2000s areal density progress has increasingly been challenged by a superparamagnetic trilemma involving grain size, grain magnetic strength and ability of the head to write. In order to maintain acceptable signal to noise smaller grains are required; smaller grains may self-reverse (electrothermal instability) unless their magnetic strength is increased, but known write head materials are unable to generate a magnetic field sufficient to write the medium. Several new magnetic storage technologies are being developed to overcome or at least abate this trilemma and thereby maintain the competitiveness of HDDs with respect to products such as flash memory-based solid-state drives (SSDs). In 2013, Seagate introduced one such technology, shingled magnetic recording (SMR). Additionally, SMR comes with design complexities that may cause reduced write performance. Other new recording technologies that, as of 2016[update], still remain under development include heat-assisted magnetic recording (HAMR), microwave-assisted magnetic recording (MAMR), two-dimensional magnetic recording (TDMR), bit-patterned recording (BPR), and "current perpendicular to plane" giant magnetoresistance (CPP/GMR) heads. The process of initializing these logical blocks on the physical disk platters is called low-level formatting, which is usually performed at the factory and is not normally changed in the field. [h] As a next step in preparing an HDD for use, high-level formatting writes partition and file system structures into selected logical blocks to make the remaining logical blocks available to the host's operating system and its applications. The file system uses some of the disk space to structure the HDD and organize files, recording their file names and the sequence of disk areas that represent the file. Examples of partition mapping scheme include Master boot record (MBR) and GUID Partition Table (GPT). Examples of data structures stored on disk to retrieve files include the File Allocation Table (FAT) in the DOS file system and inodes in many UNIX file systems, as well as other operating system data structures (also known as metadata). As a consequence, not all the space on an HDD is available for user files, but this system overhead is usually negligible. The total capacity of HDDs is given by manufacturers in SI-based units[k] such as gigabytes (1 GB = 1,000,000,000 bytes) and terabytes (1 TB = 1,000,000,000,000 bytes). The practice of using SI-based prefixes (denoting powers of 1,000) in the hard disk drive and computer industries dates back to the early days of computing; by the 1970s, "million", "mega" and "M" were consistently used in the decimal sense for drive capacity. However, capacities of memory (RAM, ROM) and CDs are traditionally quoted using a binary interpretation of the prefixes, i.e. using powers of 1024 instead of 1000. Internally, computers do not represent either hard disk drive or memory capacity in powers of 1,024, but reporting it in this manner is a convention. The Microsoft Windows family of operating systems uses the binary convention when reporting storage capacity, so an HDD offered by its manufacturer as a 1 TB drive is reported by these operating systems as a 931 GB HDD. Mac OS X 10.6 ("Snow Leopard") uses decimal convention when reporting HDD capacity. The default behavior of the df command-line utility on Linux is to report the HDD capacity as a number of 1024-byte units. 8 Obsolete 362 241.3 117.5 ? ? ? 54 mm × 8 mm × 78.5 mm[n] = 33.912 cm³. This form factor, originally introduced by Integral Peripherals in 1993, evolved into the ATA-7 LIF with dimensions as stated. For a time it was increasingly used in digital audio players and subnotebooks, but its popularity decreased to the point where this form factor is increasingly rare and only a small percentage of the overall market. There was an attempt to standardize this format as SFF-8123, but it was cancelled in 2005. SATA revision 2.6 standardized the internal Micro SATA connector and device dimensions. As of 2012[update], 2.5-inch and 3.5-inch hard disks were the most popular sizes. HDDs are accessed over one of a number of bus types, including as of 2011[update] parallel ATA (PATA, also called IDE or EIDE; described before the introduction of SATA as ATA), Serial ATA (SATA), SCSI, Serial Attached SCSI (SAS), and Fibre Channel. Bridge circuitry is sometimes used to connect HDDs to buses with which they cannot communicate natively, such as IEEE 1394, USB and SCSI. The HDD's spindle system relies on air density inside the disk enclosure to support the heads at their proper flying height while the disk rotates. HDDs require a certain range of air densities in order to operate properly. The connection to the external environment and density occurs through a small hole in the enclosure (about 0.5 mm in breadth), usually with a filter on the inside (the breather filter). If the air density is too low, then there is not enough lift for the flying head, so the head gets too close to the disk, and there is a risk of head crashes and data loss. Specially manufactured sealed and pressurized disks are needed for reliable high-altitude operation, above about 3,000 m (9,800 ft). Modern disks include temperature sensors and adjust their operation to the operating environment. Breather holes can be seen on all disk drives – they usually have a sticker next to them, warning the user not to cover the holes. The air inside the operating drive is constantly moving too, being swept in motion by friction with the spinning platters. This air passes through an internal recirculation (or "recirc") filter to remove any leftover contaminants from manufacture, any particles or chemicals that may have somehow entered the enclosure, and any particles or outgassing generated internally in normal operation. Very high humidity present for extended periods of time can corrode the heads and platters. External hard disk drives[q] typically connect via USB; variants using USB 2.0 interface generally have slower data transfer rates when compared to internally mounted hard drives connected through SATA. Plug and play drive functionality offers system compatibility and features large storage options and portable design. As of March 2015[update], available capacities for external hard disk drives ranged from 500 GB to 10 TB.